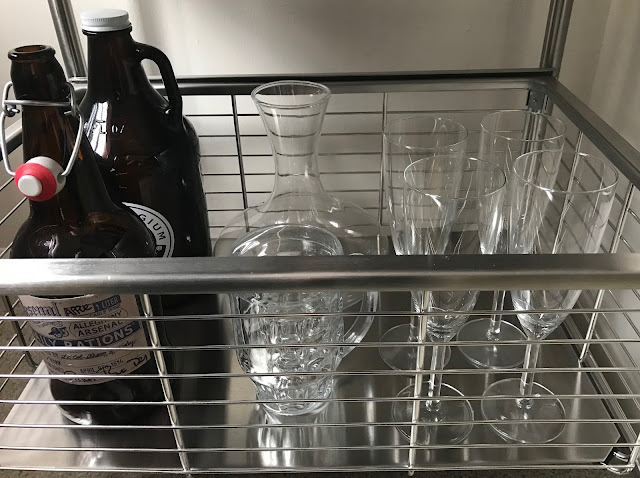 Moving into my first apartment sans roommates, there were a few things I prioritized: cozy/mid-century vibe, new cookware, and a chic bar cart. Seriously, I think my parents were disturbed by the fact that I was more concerned about a bar cart than a dining room table. (Don't worry, I have one of those, too.) A nice bar cart just screams "adult" and "Pinterest" to me—two things that are probably important to you, too! 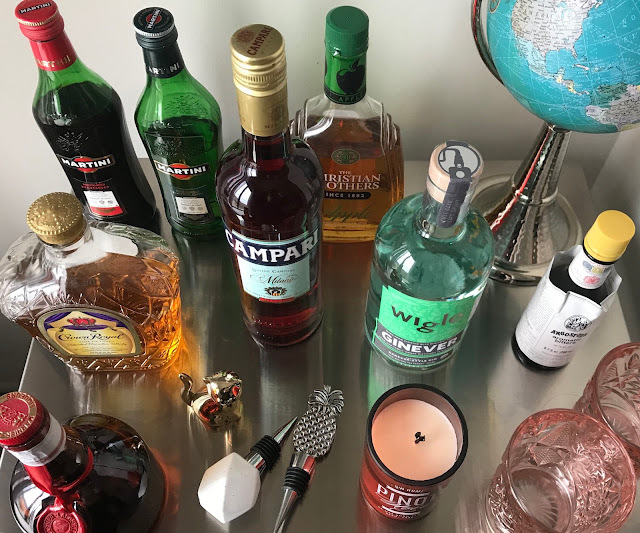 Whether you're having people over for Thanksgiving or throwing a holiday soirée in December, there's still time to ensure your bar cart is fashionably on-point. Check out my bar cart tips and tricks to impress your guests and serve up drinks in style. 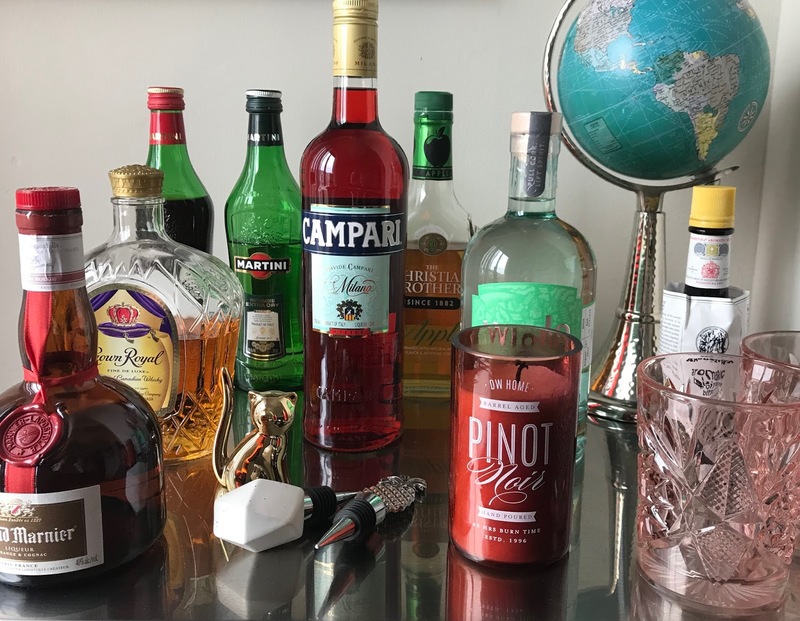 If you don't have a bar cart, it's time to get one! You can find chic, affordable options at places like HomeGoods, At Home, and, of course, IKEA. My bar cart is a classic, simple version from IKEA. For $149, it is spacious, useful, and sleek. I wanted a fresh canvas to really make my own, but there are plenty of other options out there, including gilded, glass-top carts and rustic, wooden carts. Find the one that fits your decorating scheme and personality best! Grundtal Kitchen Cart from your favorite Swedes. TIP: You want your cart to look curated, not crowded. Pick a few of your favorite cocktails to feature. If yours includes a rack feature, feel free to use that for a few bottles of wine while you store your main collection in a wine fridge and/or larger wine rack. Likewise, you can stash extra bottles of hard liquor in a cabinet. The booze is critical but the accessories make the cart. After you add your details, edit a few out. 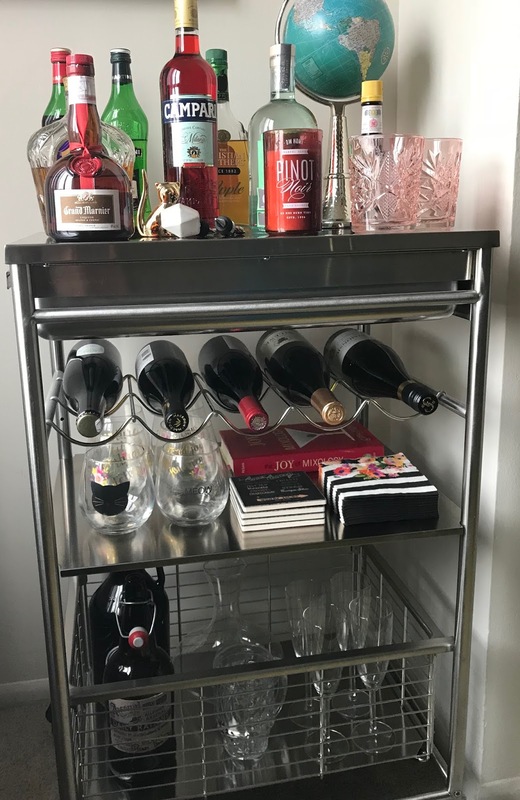 I realized my bar cart was getting a little out of control when it started to become a catchall for random alcohol-related objects. For example, I had an airplane-sized bottle of Sauvignon Blanc from nice flight attendants on one of my many trips home from D.C. While it was swell of them to give me free booze, the tiny bottle probably didn't need to be on top of my bar cart. TIP: After you add details, remove 1-2. Now you have the perfect amount. On the top, I have rose glasses from West Elm; a tiny, gold cat; a few bottle stoppers; a wine-scented candle; and a small globe on a pedestal. I have globes all over my apartment so this helps to tie the cart to the rest of my decor. Things like shot glasses, extra bottle stoppers, and corkscrews are tucked away in the drawer below the top shelf. Full of boozey fun but not overdone. 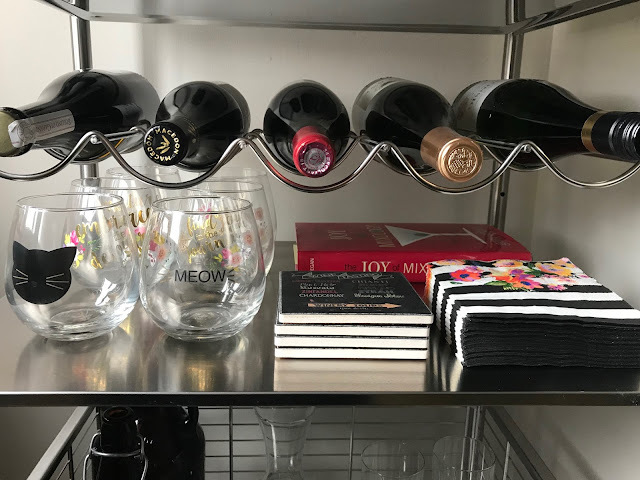 While I keep my quality stemware safely tucked away where the cat can't mess with it, I like to have a few glasses and useful objects within reach, too. First and foremost, I keep coasters and cocktail napkins handy because I have a stark white dining room table that isn't asking for red wine stains. TIP: Prevent table rings with attractive coasters and cocktail napkins for your guests. Easy-to-grab glasses, napkins, and coasters tucked under the wine rack. These useful objects all tell their own story! Do you have a bar cart? Share your pictures on Instagram and tag @megandmerlot!